A float-to-the-top ideas log built with React and Redux, among others. Keep general idea notes and idea notes in named sections. Each time a section is edited, it floats to the top. Export to an IDEAS.md file. Import an .md file in the correct format by dropping it on the app. 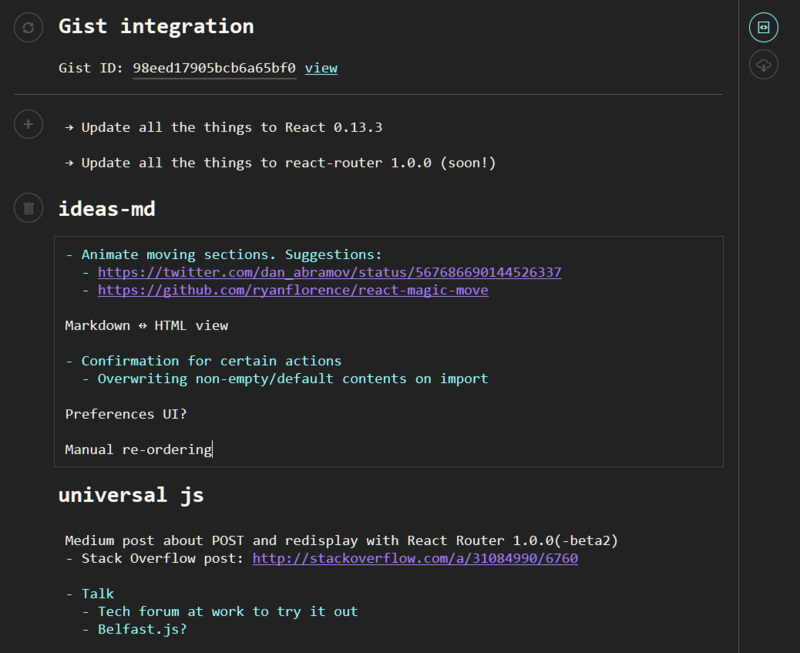 Ideas can be synced with a GitHub Gist containing an IDEAS.md file. Ideas can be saved to an existing Gist if you generate a personal access token. Life_Insurance_Quote: React port of a life insurance quick quoting application. react-lessons: Tool for creating and taking interactive React tutorials. Uses Redux, supports es6 and es7.